As this year’s General Assembly session nears the half-way mark bills of interest to the Catholic Conference have advanced; others still stalled; some not yet introduced. Fr. Larry Snyder addresses participants at the annual Catholics @ the Capitol event held in Frankfort. He is President of Catholic Charities USA. 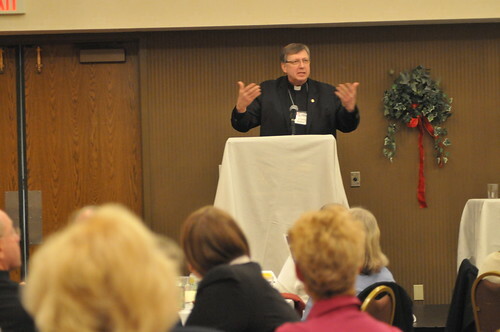 Also, this past Monday and Tuesday, 130 parishioners from Kentucky’s four Catholic dioceses gathered in Frankfort for Catholics @ the Capitol to learn about legislative priorities and to meet with their State Senators and Representatives. On Monday evening Bishop Ron Gainer celebrated Mass and delivered a homily which touched on the important issue of religious liberty. Several members of the House of Representatives joined us for the meal following the liturgy and then heard Fr. Larry Snyder describe new and innovative ways to help people escape poverty: Speaker Pro-Tem Larry Clark, Majority Whip Tommy Thompson, Representatives C. B. Embry, Terry Mills, Jim Wayne, Addia Wuchner, and Brent Yonts. All members of both chambers were invited. To leave a message for your legislators call 1-800-372-7181. SB 63 – SUPPORT – This legislation would replace the use of the death penalty in Kentucky with Life Without Parole. It remains in the Senate Judiciary Committee waiting to be heard. The Lexington Herald-Leader recently featured this editorial: Suspend state’s death penalty lottery. SB 75 – SUPPORT – This bill respects the religious beliefs of the Scwartzentruber Amish and provides for the safety of Kentucky drivers by allowing the option of using reflective tape on slow-moving non-motorized vehicles so they are visible to approaching cars. The Conference supports SB 75 which passed out of the Senate unanimously and is now waiting a hearing in the House Transportation Committee. Two House bills – – on this same topic are waiting for a hearing in this committee. It appears they will take up HB 133 which is the least effective of the three proposals. SB 75 appears to be the best crafted of the three bills and is the one CCK prefers to see passed. SB 102 – SUPPORT – This bill makes clear the legislative intent of past legislation related to requiring that women seeking abortions receive all the information necessary about the surgery in a manner that respects their dignity and their need for quality health care. Current practice allows a woman to listen to a recorded message about the procedure, a practice that does not allow her to ask questions nor take into account her own person medical history. This bill makes clear that this information is to be imparted in a face-to-face setting with a health care professional. It passed the Senate on February 8 with only five dissenting votes – Senators Clark, Harper-Angel, Gerald Neal, Tim Shaughnessy, and Kathy Stein – and is now in the House awaiting assignment to a committee. Senator Robin Webb was not present. The remaining 32 Senators all voted yes. SB 103 – SUPPORT – This bill would require an ultrasound prior to an abortion. It cleared the Senate committee and is waiting for a vote on the Senate floor. Bills like HB 5 and SB 118 end up harming citizens and other legal residents of the U. S.
SB 118 – OPPOSE – The title of this bill – AN ACT relating to restricting welfare and public benefits for illegal aliens – is clear in its intent. 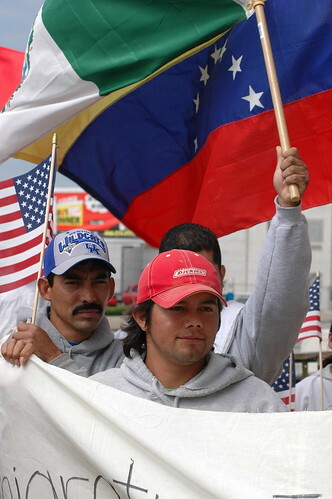 However, undocumented aliens are not eligible for public benefits and Kentucky’s various departments that manage the distribution of public benefits already screen to exclude those not eligible, whether undocumented or documented, i.e. citizens and others legally present. The Conference has worked with the Catholic Legal Immigration Network and developed a list of concerns about the bill: Talking Points Summary for SB118. The Chamber believes it is important for businesses, particularly those who operate in multiple states, to have a single set of federal requirements to meet instead of a patchwork of federal, state and local laws that impose an inordinate financial and administrative burden. The Conference opposes it because of flaws in the E-Verify system that affect citizens and others legally present who are allowed to work, while at the same time not stopping those without authorization to work to do so. See Five Facts About State Mandatory E-Verify Laws. HB 70 – SUPPORT – Since we last posted on this bill it has passed out of committee and is awaiting a vote on the House floor. A vote is expected in the coming week. To read the Courier-Journal article click here. And a Courier-Journal editorial: Ex-felons’ voting rights. HB 114 and HB 133 – SUPPORT – These two bills are similar to SB 75, which seeks to protect the religious liberty of the Amish who object to certain images being attached to their non-motorized vehicles, yet are satisfied with other means to ensure they can be seen at night and are not a danger to other drivers. We prefer SB 75, but also support the other two bills. HB 145 – SUPPORT – For unknown reasons the Chair of House Judiciary continues to refuse to set a date for a hearing on this important bill which will replace the death penalty for severely mentally ill persons with lengthy prison terms, including life without the possibility of parole. For more information about the bill see this post. Call the legislative message line noted above and urge Representative Tilley to give HB 145 a hearing in his committee. The votes to send it to the floor are there. And there are enough YES votes in the House to send it to the Senate where Senator Jensen has indicated he will hear it in the Senate Judiciary Committee. HB 332 – SUPPORT – This is the payday loan bill and you can read more about it here. We learned this week that the Chairman of Banking and Insurance, Rep. Jeff Greer, said he would not hear the bill this year. He told this to the Executive Director of the Kentucky Council of Churches, as well as to Fr. Delahanty. He has since said the same to the bill’s sponsor, Rep. Darryl Owens who has requested that the bill be heard. We have asked him to reconsider, but he will need to hear from many people who live in his district. Rep. Greer’s House District 27 includes parts of Bullitt, Hardin, and all of Meade counties. If you live in that district or have friends who do, please call the number above and leave a message urging him to give HB 332 a hearing in his committee. Members of the Kentucky Coalition for Responsible Lending have learned that several who voted no or did not vote last year are now willing to vote YES in committee. Photo: Kay Chernush for the U.S. State Department. HB 350 – SUPPORT – With nearly half the members of the House sponsoring this bill to provide funding to train police, provide services to victims of human trafficking and create new criminal offenses, this bill should receive the hearing in committee it deserves. It builds on Kentucky law passed several years ago regarding “modern day slavery” and is intended to bring more attention to this issue. The U. S. Conference of Catholic Bishops have a wealth of information at their website on the extent of trafficking and programs to address it. HB 390 – SUPPORT – Copper theft from churches and others is a growing problem in Kentucky and so the Conference joined with many others to support legislation to try and discourage this kind of theft by requiring more of those likely to be in the business of purchasing it. Along with many others we will OPPOSE all efforts to expand gambling in our Commonwealth for reasons stated in an earlier post. The bill most likely to move will be introduced in the Senate on behalf of Governor Beshear. We still look forward to the introduction of an informed consent bill in the House. House leaders have indicated to our Bishops that if a Democrat would introduce this legislation it would pass in the House, as it did before in 2006. Several have been approached by the Conference and Right to Life and to date none have been willing to sponsor. We are continuing to work on the language for legislation to create and Education Business Tax Credit bill that, once passed, will provide new revenue to benefit the education of all Kentucky students, whether in public or non-public schools.